G.P. Putnam's Sons Books for Young Readers, 9780525514817, 32pp. Just right for fans of Emily Winfield Martin's Dream Animals, this gorgeously illustrated story-in-verse about baby moons growing up in a celestial nursery is ideal bedtime reading and a perfect new baby gift. In the starry dark of night, / a secret moon world comes to light. / Make a wish and you just might / visit baby moons tonight. Follow the moon babies on their busy day from waking up in their crescent cradles, to breakfast on the Milky Way, to bundling up for moonwalks, to orbiting the earth in a lunar carousel, and more! And at day's end, watch as the babies finish bathtime with stardust powder, snuggle up with nursery rhymes and lullabies, and finally drift off to sleep. Karen Jameson's charming verse is a joy to read aloud, and Amy Hevron's enchanting illustrations are simply irresistible, making this the perfect read-aloud to send little ones off to dreamland. Karen Jameson is a children's author, a poet, a teacher, and a literacy advocate. 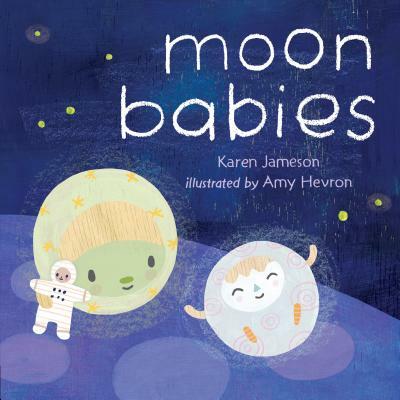 Moon Babies is her debut picture book. She lives and works in Southern California. Follow her on Twitter @KarenJameson15. Amy Hevron is the illustrator of the forthcoming picture books Trevor by Jim Averbeck and Dust Bunny Wants a Friend, which she also wrote. Originally from Texas, she currently resides in Seattle. Learn more at amyhevron.com or on Twitter @amyhevron.